In a medium saucepan boil potatoes in water for 15-20 minutes or until tender. Remove from heat. In a large mixing bowl, place potatoes, shredded cheese, milk, salt and pepper. Mash with a fork or potato masher, combining all ingredients. Set aside. Place canola oil in a medium skillet on medium-high heat. Place 1 tablespoon of mashed potato mixture on a tortilla and roll. Carefully submerge rolled tortilla into hot oil with seam side down. Fry for approximately 2-3 minutes or until browned evenly on all sides. Place on paper towel lined plate to drain excess oil. Serve topped with Mexican crema, lettuce, tomato and crumbled cotija. Add fresh spinach, cooked chorizo, or pieces of ham to mashed potatoes for a variation of the dish. Growing up in a border town, our trips to Mexico were common and anticipated. Our weekend visits included lunch at our favorite flauta stand. Their menu included flautas filled with shredded beef, beans, cheese, and–my favorite–potato and cheese. 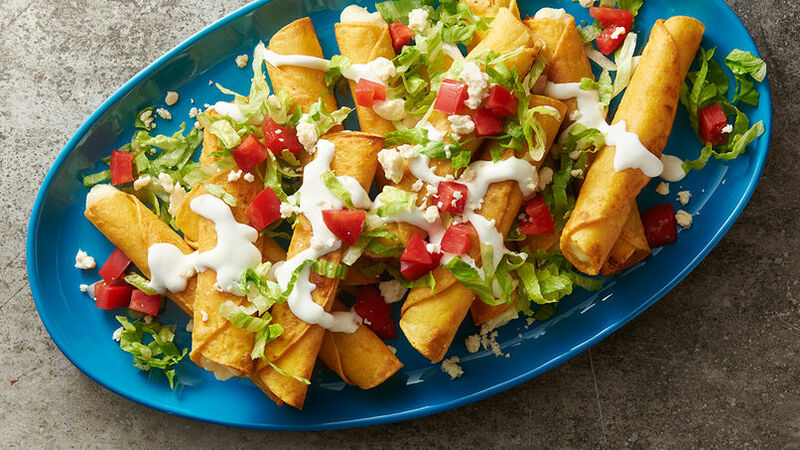 These flautas are topped with crema, salsa, savory cheese, and served with a side salad. Why not make these at home? If you're having a Cinco de Mayo get-together, add these to the menu! They are a favorite among kids and adults, and will please your vegetarian guests, too. Make plenty because they will be devoured quickly!